Artemisinin is isolated from Artemisia annua L. with peroxide-containing sesquiterpene lactone structure. Because of its unique structural characteristics and promising anticancer, antivirus activities, it has recently received increasing attention. The aim of this review is to summarize recent discoveries of artemisinin's novel derivatives with new pharmaceutical effects beyond malaria with a focus on its antitumor and antivirus activity, as well as potential results of combination therapy with other clinical drugs. Keywords: Anticancer activity, Antiviral activity, Artemisinin, Artemisinin derivatives, Dimer, Trimer. Keywords:Anticancer activity, Antiviral activity, Artemisinin, Artemisinin derivatives, Dimer, Trimer. Abstract:Artemisinin is isolated from Artemisia annua L. with peroxide-containing sesquiterpene lactone structure. Because of its unique structural characteristics and promising anticancer, antivirus activities, it has recently received increasing attention. 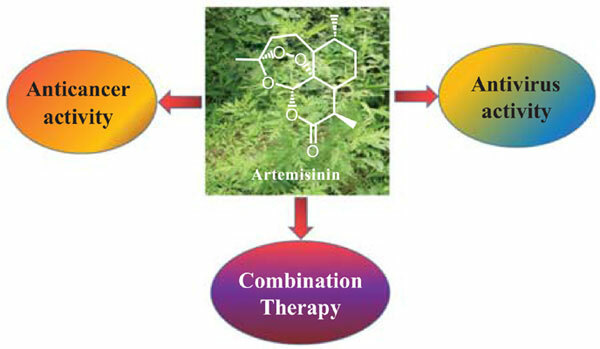 The aim of this review is to summarize recent discoveries of artemisinin's novel derivatives with new pharmaceutical effects beyond malaria with a focus on its antitumor and antivirus activity, as well as potential results of combination therapy with other clinical drugs.